The Dining Room at Trefeddian Hotel01654 767213 work RestaurantThe Trefeddian Hotel serve everything from a three course dining room lunch to more relaxed light bites, sandwiches and delicious homemade afternoon tea in the hotel lounges or on a sunny day on our stunning sea view terrace. Welsh Afternoon Teas are a firm favourite and Traditional Afternoon Teas are the ultimate indulgence. Sunday Lunch is the main event of the week at the Trefeddian! Forget cooking and washing the dishes, take all the hard work away so you can relax on what should be a day of rest! 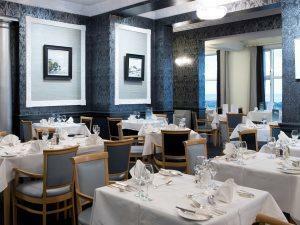 Hotel residents enjoy a hearty cooked breakfast to set you up for the day and a five course table d'hote evening meal. The menu changes daily using fresh local ingredients, the hardest part of your evening will be choosing which dishes to order! 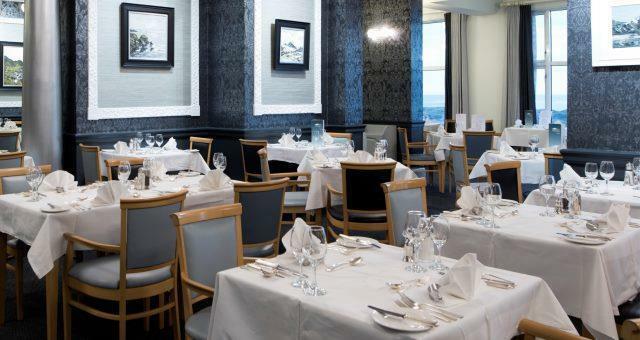 Families won't miss out either as The Trefeddian Hotel serve an early children's supper or alternatively children can dine with parents in the evening and either choose from the main dinner menu or a child friendly main meal option. Choose your tipple from the extensive wine list or choose one of our fantastic local ales. By Rail: Coming by rail your destination is Aberdyfi train station. Trains on this line come via Shrewsbury and the journey from Shrewsbury takes approximately 2 ¼ hours.If coming by train you can book a taxi to meet you at the station. By Car: Approaching from the South, the hotel is on the far side of the village, ¼ mile after the speed restrictions for the village end on the right hand side of the road, marked by a large blue sign.